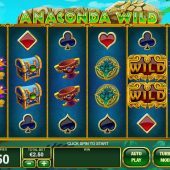 Anaconda Wild slot dedicates its only feature to these slithering serpents from South America so it's only natural we get a jungle background to the reels and the expected Inca pipes music with drums as the reels stop. 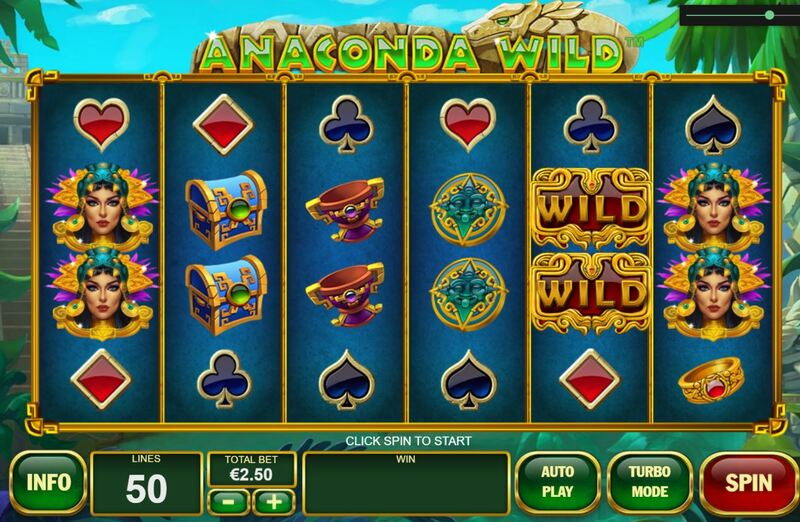 Snakes aren't often used in online slots unless they feature a Snakes and Ladders type of bonus game but the few that there are such as Leander's Snake Slot and Novomatic's Snake Rattle and Roll don't have the polished graphics we see here on Anaconda Wild. That leaves just one question - what do we need to do here for our bankroll to avoid a bad case of snakebite? The first impression you'll have no doubt received here is the large grid of 6 reels of 4 rows each usually seen on 4096-way games such as Buffalo Blitz or Raging Rhino. Here though we simply get 50 fixed pay lines and you can actually bet just 25 coins instead of the expected 50. All symbols are fully stacked except for the Anaconda which will reveal its tricks shortly. The 6-of-a-kind pays are Wilds at 1000 coins or 20x bet, Priestess 600, Chest 160, Cup 120, Ring or Dagger 80 with four card suits all awarding 50 coins for the full way of 6 symbols. There are no scatters but the Anaconda does provide the one in-play feature we get here. On any position a single Anaconda Wild may land, sometimes more than one. This will reveal the snake which slithers to adjacent and not diagonal positions with a respin occurring on each move he makes. So, if it appears you will get at least 4 respins as the Anaconda only disappears when he gets back to the tile he started from - this animation does have the unfortunate effect of making the Anaconda seem like he's disappeared up his own ahem!, well you get my drift. The lowest possibility therefore is a small circle which will create a 2x2 Wild for the 4th. and final respin. He could also for example appear at the bottom of reel 2 and move all the way to the top then come back down on reel 3 for 8 respins of which the last would have both reels 2 and 3 Wild. Any number of Wilds from 4 to all 20 is possible.